Money, Power & Respect on Underground, "Whiteface"
Any virtue, pushed too far, can become a vice. This is especially true of ambition. And ambition is one thing nearly all of the characters on Underground have in common. We know that, for those who were living under slavery, ambition is what pushed them to run, and ambition is how the likes of Rosalee and Noah made it to freedom. Ambition drives Elizabeth and Georgia—and, in very different ways, Cato, Ernestine and Clara. In “Whiteface,” we really come to understand how these characters’ ambitions work as both virtue and vice, and how far they’re willing to go to get some kind of agency—money, power or respect (or all three, if they’re Cato)—while existing under a regime that seeks to keep such things out of their reach. “Whiteface” opens up with a scene that makes me wish Spike Lee’s Bamboozled was required viewing for everyone. As rich, offended white folk leave his latest production, Cato sits in a theater cackling madly to himself, almost as if he’s just seen a Black Lives Matter-inspired ad campaign starring a Kardashian sister. And even though I know there is such a thing as going broke after being rich, and even though I know his plan to set America on fire will most likely be thwarted long before it’s achieved (because he’s clearly too damaged, and too obsessed with his own ideas of vengeance), I can’t help but laugh with him. There are few feelings greater than watching white people in power (or white people, anywhere) squirm when they’ve encountered a black person or work of art that makes them feel uncomfortable—one that manages to reflect their weaknesses and their history back to them in such a way that they—perhaps for the first time in their lives—feel they do not belong in a particular space. Discomfited white people give me immense pleasure as well, because I understand how dangerous the world is for black people, when white people are comfortable. I’m right there with you, Cato… and who’s to say I’m not so obsessed that I risk tying my own noose as well? It’s a slippery slope, ambition, and we’re watching, breath held, as each of our characters traverse it. Cato believes in money, power and respect—and using as much of it as he can against white America. His ambition is to bring whites (who he describes as “slaves to capitalism”) to their knees, in some way or another. The other characters may not want such grand things, but power and respect are certainly on everyone’s minds. Clara has come to Ernestine, in hopes of being a protégée of sorts. She admits that she has thought about other ways to take control—cutting herself, as a means of showing the people around her how much pain she’s in, and also, strange as it may sound, how much control she does in fact have over her own body. Ernestine describes this as “the worst kind of control,” and begins to show Clara another way. But what will become of this tutelage? Clara seeks power—that Season One, ‘Stine-in- the-Big-House power (or “power”)—but will she know what to do with it, if she’s successful? Will she understand its limits, and its dangers? Ernestine has been suffering, presenting like a shell of her former self. And she reveals at the end of “Whiteface” that she intends to use Clara and her budding relationship with the young master to get off this island she was sent to. But what happens when you use someone (who barely has any power at all) for your own gain? We’ve seen how far Ernestine can go (RIP Pearly Mae), and as excited as Clara is to get that first kiss from the master, I can only assume some very real problems lie ahead. The same is true for other characters, in search of agency. For Rosalee, freedom and agency mean being able to go back and help her surviving family members escape from slavery. For Noah, freedom is having a choice in whether or not to help Rosalee—but this choice comes with its own terrors. For Georgia, agency means passing as a white woman, and holding close all those secrets that come with it. (And Georgia makes a powerful point about the effects of her own desire for agency and a certain amount of power as an abolitionist; what has she forgotten, of her own past, and her own mother, in an attempt to pass as a free, white woman?) And for Elizabeth it means fighting back, and finally unmasking herself as a slave stealer. All of these moves towards agency will have consequences for our heroes—but it’s good to know that’s not stopping any of them. Still, “Whiteface” highlights some very real problems with the desire for money, power and respect under white America. 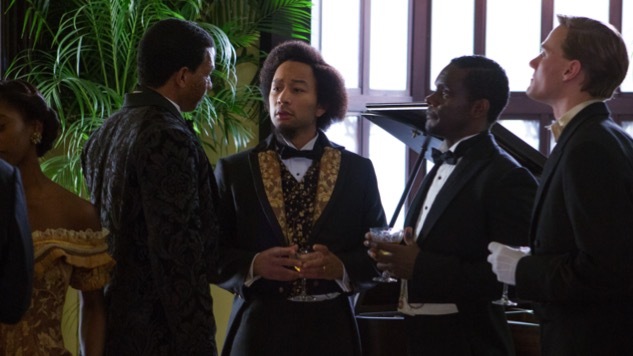 At Cato’s party—which ends on a horrible note, after Patty Cannon and August crash it—we meet Frederick Douglass (played by Underground executive producer John Legend… who needs to take all of my money and make that Black Wall Street show ASAP), who offers up some powerful words to Cato and William. The three discuss the difficult paradox of needing to both evade white people, and entice them, in their quest for freedom. Douglass says he was careful not to reveal certain details of his escape in his autobiography, lest such details be used against other runaways. At the same time, he needed to reveal enough about his life to convert whites—specifically, white Northerners—to the abolitionist movement. I couldn’t help but think about the drive for money, power and respect—and its parallels to the drive towards freedom—and how complicated it gets because of the (presumed) need for white assistance or approval. In the same way that there’s a real danger in a movement dependent on white empathy (see Hari Ziyad’s fantastic “Empathy Won’t Save Us” for more), there’s real danger in adopting the capitalistic ideals of our own oppressors. It’s the exact kind of problematic message that’s embraced by and amplified in the rap music I love. On the one hand, The LOX, Lil’ Kim and DMX were right on the iconic track, “Money, Power & Respect”—just as right as Wu Tang Clan was when they created “C.R.E.A.M.” But cream, money, power and respect all exist under certain terms in America—so, when black Americans do finally access them, what does it actually amount to? What can we do, if we do in fact achieve money, power and respect in a time when most blacks still live under an oppressive regime? And if America were to burn in the way that Cato hopes it will, won’t that change the very meaning of such agency? In other words, what does freedom look like, not just for a few blacks who’ve made it, but in a truly free America? We artists, we fighters—we descendants of Rosalee, Ernestine, Georgia, Noah and Cato—we’ll have to keep imagining such a place and time. For now. Next week’s potentially epic, Aisha Hinds-centered episode was hinted at during that conversation at the party: “Did I tell you I finally convinced Harriet to speak?” Um. Yassss. While I’m very glad ‘Stine broke up with her abusive lover, I sure wish the writers hadn’t so intentionally spelled out the connection between the violence on the fields and the violence in their relationship. I love a good ‘Stine monologue, but something about this felt heavy-handed. The Noahlee reunion was as sweet as we might have hoped it would be, and I really like that they’re keeping the pregnancy a secret from Noah for a little while longer. I simply could not envision how Rosalee was going to tell Noah, without it seeming just… too much, and it’s all the more interesting to watch her withhold this information, in an attempt to get Noah to agree to the run down south. And, okay, it’s not that I have some sick desire to see everyone on this show violently abused, but I did find it odd that Elizabeth got away with barely a scratch after being hunted down by those Klan members. It occurred to me that she’s one of few characters who has not ever really, physically suffered on the show, which then made me think of possibly the greatest headline of 2017: “What Becky Gotta Do to Get Murked?” But that’s a conversation for another day.